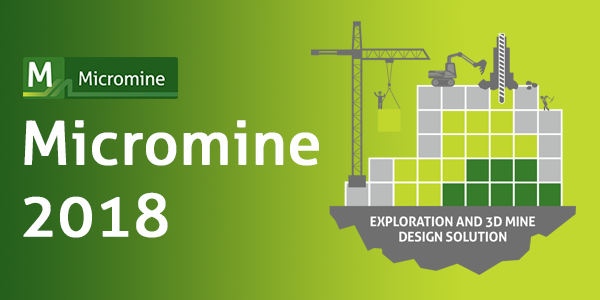 Micromine 2018 is the latest version of MICROMINE’s leading exploration and 3D mine design solution and provides explorers with an in-depth understanding of their project so prospective regions can be targeted more effectively, increasing the chance of a project’s success. Miners are provided easy-to-use modelling, estimation and design tools to simplify day-to-day production tasks. Micromine 2018 allows users to capture, manage and interpret critical data, and is relevant to all stages of the mineral extraction process. Micromine 2018 has been built with the user in mind and includes a range of new features and enhancements that increase the overall usability and performance of the software. New licensing system with many new options: node locked licences, network licence pools, borrowing options, and traditional stand-alone (dongle) licences. Conversion to Unicode, supporting extended and multilingual character sets. Optionally use Unicode Text Format (UTF-8) for DATA and related files. Major enhancements to the Micromine DATA file format, with new create/modify options and support for date, time, date/time, and colour field types. Many user interface enhancements, including collapsible dialogs, Undo/Redo for forms, colour theme switcher, numerous auto-load additions. New resource estimation workflows with visual editing of search ellipsoid and block model extents, auto calculation of experimental variogram models, auto fitting of theoretical variogram models, and interactive range/sill measurement for determining search ellipsoid radii. New native CAD support in Vizex, with support for labels, polygon meshes and 3D mesh entities. New CAD cursor with several cursor styles and snapping modes and dedicated import/export options. New drillhole tools including auditing and exporting an entire database; validation errors are prefixed with severity level, databases are more forgiving of invalid data; new moving average Drillhole Graph style. Upgraded trend model for Implicit Modelling; lithology modelling with indicators instead of distance. Some block model management tools added to the Mining module, along with IDW interpolation; numerous wireframing and underground mining tools added to the Surveying module. New optimised shell option for pit design; many enhancements to ring design and blasthole design. New licensing system provides many more licensing options: node locked licences with no dongle, network licence pools with different seats per module; borrowing options, and traditional stand-alone (dongle) licences. Conversion to Unicode, supporting extended and multilingual character sets. Optionally use Unicode Text Format (UTF-8) for DATA and related files; ideal for formatting statistical reports etc. Modernised formatting in reports and properties windows, which now include extended characters e.g. m³, Al₂O₃ etc. New dialog-based File | New and File | Modify provide robust tools for creating and modifying file structures. Combines the capabilities of the old structure editor (replicate, increment, copy/paste) with new dialog options (undo/redo, sort, move up/down). Separate toolbar buttons and submenus for creating a file from a template, creating a new macro, and creating a new lookup table provide clear options for creating different Micromine files. New date, time, date/time, and colour field types in file definition. Can now store, display, and manage times and dates, and embed colours in Micromine data files. Automatic conversion of Excel’s 5-digit dates into normal dates on import, seamlessly converts Excel date/time data into readable values. New EPSG-based coordinate system converter, which supports the latest high-precision conversion methods, is much simpler to set up, and is far more versatile than the existing version. New Options | System | Shared Projects. Keep a local copy of default form sets, File Editor logs and temporary files, reducing the potential for conflicts in shared network projects. Added undo and redo to all dialogs. Can now modify a large dialog without worrying about returning to the previous configuration. New ability to collapse a dialog, providing access to Vizex without needing to close the dialog beforehand. Interact with Vizex without closing the current dialog (and losing the settings). New Vizex Colour theme definition that instantly switches between dark and light backgrounds without losing ability to see linework and other data. Vizex CAD/GIS is now just GIS, now with drag/drop support. Can now drag and drop any combination of MapInfo vectors and images into Vizex. Micromine will load TAB files as vectors or images as required. New Vizex CAD form for simplified display of CAD data, with improved support for labels, polygon meshes and 3D mesh entities. Separate options to Import and Export CAD files avoid limitations of the generic CAD/GIS import/export when dealing with CAD formats, including wireframe meshes. Import Vector (GIS/GPS) now optionally imports colour and line-width attributes if present in the original file. Import Vector (GIS/GPS) now includes user-selectable attributes, and allows attribute names to be mapped directly to standard fields. Inclusion of Centre for Exploration Targeting Perceptually Uniform Colour Maps in the palette list provides new colour palettes that are optimised for displaying spatial data. New Export Drillhole Database option exports an entire drillhole database to an Excel file with multiple tabs (per file), or as separate files in Excel or CSV format. Can now quickly package up an entire drillhole database to be distributed outside of MM. New Audit Drillhole Database option summarises the files and fields that comprise a drillhole database. Documents the contents of a drillhole database, lists files and fields, and file contents. Separate line type and line width options for hatch borders provide greater flexibility to apply styles to hatch borders. Hugely more configurable wireframe Draw Style Includes new Default Hatch and From Wireframe options, with control over hatch foreground, background, and fill for 2D slice and new 2D Silhouette. Advanced Hatch option provides even more flexibility. New Maintain Section Focus button in the Section Control File toolbar maintains visual centre while browsing sections. New String Reordering function to renumber joins and optionally sort strings by an attribute value, optimising the internal layout of a string file. When moving selected points, strings or string segments in Vizex, holding the X, Y, Z, U, V, or W key will now restrict movement along that axis, simplifying the process of moving objects in specific directions. Added two new string smoothing methods to Strings | Tools | Smooth, which are much more robust than the existing methods. The Replicate Many function (CTRL+SHIFT+R) is now available in all dialog grid lists. Can now fill out dialog grid lists using a familiar File Editor shortcut. Added volume weighted average to Interactive Block Visibility as an alternative method for interactively calculating block model grades; ideal for sub-blocked models. Drillhole validation errors are now prefixed with Warning, Error, and Critical to indicate the severity of the errors. Drillhole databases are now more forgiving of invalid data, with options to ignore specific drillhole files, making it possible to work with known invalid drillhole data. Drillhole Graph functions now include a moving average smoothing option, ideal for noisy downhole geophysical data. File | Modify: Inserting and deleting fields now recognises the number of selected fields; insertion and deletion now works much like Excel. New option in Export | Excel to write to an existing Excel sheet without overwriting the original workbook. Histogram: new option to apply colours to bell curves and histogram bars once the data has been decomposed and a colour set created, improving the visual appearance of a decomposed histogram. Vizex Point layer is now optimised for interactively displaying point clouds with scaled symbols, with vastly improved performance compared to Micromine 2016.1. Grid Surfaces and Block Models now include Auto draw style options. Points (vertices) within a string file can now be drawn using a different colour than the string. New button provides one-click access for toggling additional grids. Grid spacing in additional grids may now be varied using expressions, providing greater flexibility to customise coordinate grid spacing within a grid. Vizex Properties window now reports cumulative volume when multiple wireframes are selected. Groups of points can now be rotated in Vizex as per the Rotate String Tool. Selected points in a GIS layer may now be interactively copied/saved via Selection menu. String | Utilities | Flatten now includes an option for the Planes to be defined using a Section Control File. Split String tool now automatically splits strings at the ends of a partial selection, creating a topologically correct result. Vizex Forms may now be sorted by ID, name, or date. New option to save a Saved View by right clicking on a layer or group in the Display Pane. New Status Bar progress indicator when draping large images shows when Micromine is still loading image data. Wireframe sets may now be sorted at loading time, based on a user-defined attribute. A colour set may now be applied to Wireframe Labels. New LAS (downhole) import option for importing logs in Log ASCII Standard format. Variogram Map and Chart semi-variogram: New Auto calculate automates the selection of initial values for displaying a variogram map or variogram chart; values are often good enough to use without further adjustments. Chart semi-variogram: new Autofit Model automates the initial estimate of nugget, ranges, and partial sills. Values are often good enough to use without further adjustments. Chart semi-variogram: new Measure Distance provides a simple visual tool for calculating distances based on proportions of the range or total sill for defining search ellipsoid radii. Drillhole Log now supports synchronised scrolling whenever multiple logs are displayed side-by-side; ideal for comparing results. Drillhole log now includes an Imaging column type for displaying flat and cylindrically wrapped (Televiewer) images. Search Ellipsoid: new tool to visually adjust the position, orientation, size, and anisotropy of the Vizex search ellipsoid. Easily position, orient, and resize a search ellipsoid. Drillhole | Merge now automatically creates new merge fields when if they don’t exist. Statistical functions and charts now support expressions as input. Some compositing tools now support density-weighted averaging; essential for commodities where grade varies with density (e.g. iron). GKZ Compositing now treats missing intervals as hard breaks. Generate Drillhole Pattern now includes an option for (collar) Z values to be defined from a DTM. When refreshing a drillhole database, a new option allows only the Trace (Collar and Survey) files to be refreshed. Vizex Contour can now contour a 3D rotated MM Grid file. Grid | Convert to MM File now includes options for treating Z as an attribute, and formatting as a block model, clarifying the distinction between elevation and attribute value. Q-Q plot now has an option to disable the line connecting the quantiles, improving the appearance of the plot. Drillhole Log: Height of an interval in a text column can now be extended if less than the font height. New Drillhole Log navigation: right and left arrow keys for Next and Previous hole; Go to Hole by Name for macros. Drillhole Log: Now supports Selection Syncing with other windows (Vizex, File Editor, Charts). Drillhole Log: A new right-click shortcut makes it easier to save a drillhole log intersection. New substitutions have been created for drillhole log and plotting, adding new ways to automate the Drillhole Log and Plot Editor when using macros. Televiewer (Drillhole Imaging): Added options for alternative orientation methods. Seam block model may now be used as input for Vizex Contour. Added several new features and enhancements to DTM | Cut and Fill Volume, including auto loading the cut and fill solids. Boosted performance of DTM | Create Surface by combining building and clipping into one step. DTM | Assign can now code a block model using a vertical surface. New tool to interactively create a new wireframe set from a Vizex wireframe selection. New Wireframe | Edit | Update and associated toolbar button updates a wireframe to match an updated construction string. Simplifies updating a wireframe from modified strings. New Change Hatch function writes 2D hatch attributes (slice and silhouette) directly to a wireframe permanently attaches a hatch pattern to a wireframe. New Compare Wireframes tool records the geometric offset distance for each vertex; ideal for identifying under- and over-break in as-built vs. designed mine headings. Wireframe Manager and Wireframe Attribute Manager now include a recent location list in the “look in” folder, simplifying the selection of wireframes from different path locations. Wireframe Manager optionally includes subfolders when searching for wireframes. Surface area and volume are now searchable attributes in the Wireframe Manager. Wireframe | Operations | Slice now uses the same output naming options as in Wireframe | Utilities | Separate. Centreline to Solid: New option for the Arch height (h0) parameter to get value from a field in the Input file. Centreline to Solid function now includes Rounded Rectangle as a profile option. Select Triangles by Construction String now works using only one string, always selecting the triangles on both sides. Sidewalls to solid now supports a user defined profile shape. Wireframe | Report | Grade Tonnage now creates the density attribute if it does not exist. Improved Wireframe | Utilities | Separate to limit the minimum volume of wireframes identified. Improved the quality of wireframes created by Block Model Outer Shell and Block Model Grade Shells to create a smoothed shell that accounts for sub-blocks. New tool to visually adjust the extents of a block model. Automatically aligns extents to Restriction wireframe, or extents of a nominated wireframe or DATA file. Structural trend may now be incorporated in omni variograms and kriging, allowing block model interpolation to go around corners. Exploits the structural trend model from the Implicit Modelling module. Orders of magnitude performance improvement of block model nearest-neighbour assignments. Added an option to remove volumes smaller than a user defined value for block model grade shells. Rearranged fields in Create a Block Model Report to better suit industry requirements. Block Model Report: Reporting cutoffs are no longer compulsory. Single seam SBM can now be created using roof or floor elevation grids. New Modelling | Seam Block Model | Intersect with Solid function to trim an SBM to a solid provides a simple way to split an SBM where it intersects a solid. New Modelling | Seam Block Model | Convert to Grid function creates a grid surface for each unique value in the material field. Output may be any combination of roof, floor, midpoint, thickness, or user attribute. Substantially upgraded Trend Model is more accurate and geometrically robust, better at handling models with varying orientations, and now supports multiple trends with decay. Lithology modelling now includes an option to use indicators instead of distance, which can produce a more robust model. New Floor/Roof to Solid function automates the creation of solids from sidewalls and roof points, accounting for varying roof height. A quicker way to create underground mine solids from sidewalls. New blasthole numbering based on blast row provides more versatile blasthole numbering. The sequence optionally restarts at the beginning of every row. New CAD Cursor displays multiple cursor types, including a classic CAD crosshair. The cursor may optionally be displayed simultaneously in all Vizex windows, and includes multiple scaling options. Advanced mode supports tangential snapping to the circumference of a circular cursor. Pit design now includes an Optimised Shell option, automatically adjusting the constructed pit to match the optimised shell while maintaining pit slope parameters, keeping the design consistent with the optimisation. New Ring Design Auto charging algorithm based on the AEL AECI method, well-accepted and robust published methods to calculate blast charging in ring designs. Surface blasthole labelling now allows customised collar and toe labels, with better labelling that enables labelling for collars and/or toes of holes. Labels can be based on any field in the blast hole database. Improved the firing sequence order for row and diagonal patterns. Create Firing Sequence form now indicates units for delay and increment. Added a Preview button to the Generate Single Drillhole dialog for consistency with the Generate Fan dialog. Can now preview the drillhole before committing the change. Improved Drillhole Fan angle behaviour so that the start and end angles always honour the measurement option. Added option to change Fan direction. Added figures to Drillhole Fan dialog to provide visual indication of how the fan direction, angle measurement and spacing algorithm will behave. New option to label collars for blastholes in a fan. Updated ring design toe spacing algorithm to use well-accepted and robust published methods. Added a new charging method based on published methods, with ability to define initiator hole. New options for Replicate ring along drive to measure ring spacing as the distance along drive or actual distance between rings. Added a function to automatically generate ring boundary string from a wireframe solid, providing an automated method for producing ring boundaries. Added ability to Copy/Paste an existing material bin in material set. In Wireframe | Report | Grade Tonnage | Material Set, a field name selection list is now presented when “binding” to a grade field. Density in a Material Set can now be calculated based on a field in the block model. Material Set right click menu now includes a View option. Improved Automatic Pit Realign tool to be more flexible and easier to use. Can easily modify a pit bench by moving points along the string. Road Design: Added output road strings that display cut/fill values for the left and right edges of the road, with an auto load check box. Added Auto load for pit shells created in Pit Optimisation/Optimise. Added Total Capital Cost field to Optimiser Output Report.